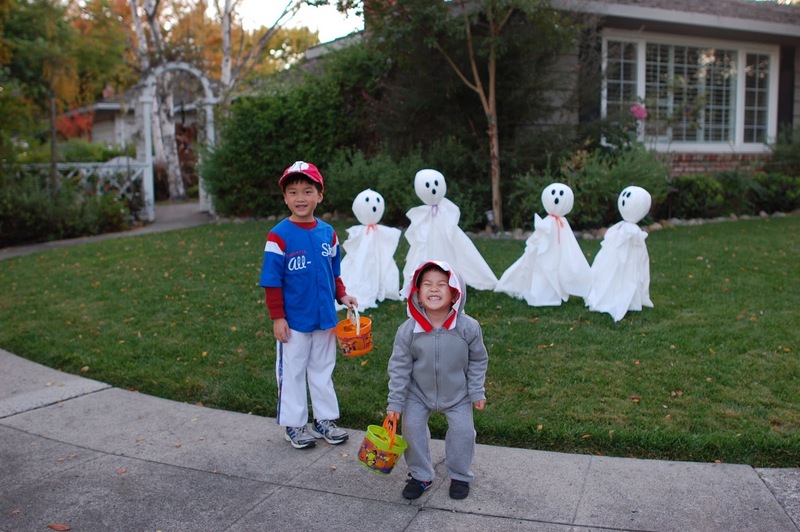 Allergy parents understand what a stressful time Halloween is. 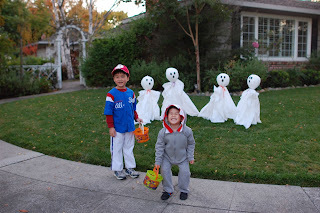 We still want our kids to dress up and do the whole trick-or-treating thing, but if you're anything like me, you're terrified of your kids eating any part of their loot. 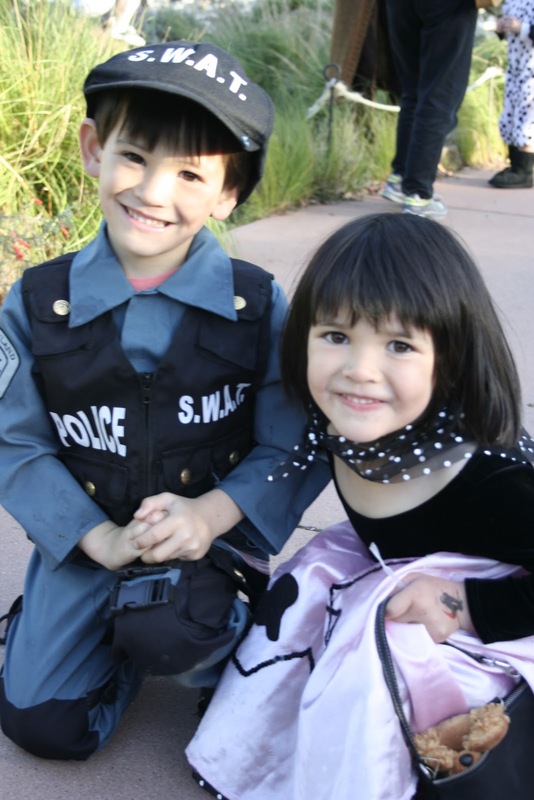 If you're still unsure of your Halloween Day strategy, Mireille Schwartz, Founder and CEO of the Bay Area Allergy Advisory Board (BAAAB), has some creative ideas for safe trick-or-treating, which were featured Friday in CNN and Yahoo News (check out Mireille's mention of us and our Food Allergy Rocks! event--tres cool). Thanks to everyone who submitted photos of your AllergyWise kids in response to last week's post to remind us what Halloween is all about. It sounds like candy trade-ins are very popular this year: at dental offices for prizes, for Lego sets, and for homemade or store-bought safe sweets! Moms (and dads! ), you are amazing! 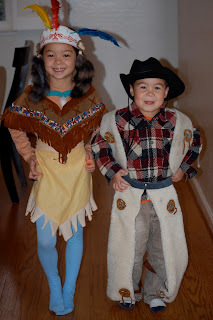 And now...our little cuties, all decked out! As an added bonus for trading in their Halloween candy, have them bring their candy to Sunday's event, along with a new or gently used book, and trade it all in for a book from our Food Allergies Rock Halloween candy trade-in. See you there! I know, I know, between all the Halloween celebrations, scrambling to get costumes together, and baking allergy-friendly goodies for school, this week is so busy you can hardly keep your head on straight. We haven't even picked up our pumpkins yet! It's not late to give your little ones a special day...with stuff you probably already have around the house, no less! Fake beard and mustache: Grab some felt and sew up a last minute disguise! Adorable! Halloween Hats: Grab some felt, ribbon, scissors, and a glue gun to make these show-stopping hats! My biggest dilemma: should I be the witch or the flower? Homemade Felt Pumpkin Game: Can you tell I love doing stuff with felt? I can almost hear their giggles now! Fun for all ages! 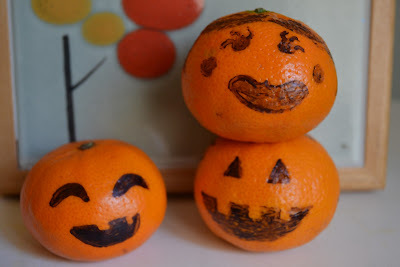 Punkin' cuties: Grab a sharpie, draw a simple jack-o-lantern face on a few little cuties, and toss them into your child's lunch for a fun, healthy Halloween surprise! Halloween Ghost Cupcake Toppers and Wrappers: I know a lot of us allergy moms have volunteered to bring in Halloween treats for school, and have absolutely no idea how we're going to find the time to do it! Free templates for super cute ghost cupcake toppers and wrappers. Cheap, easy, and done in no time! Marshmallow Ghosts: Marshmallows, generally very allergy-friendly (but please check the ingredients on your brand!) in a "ghost" bag. 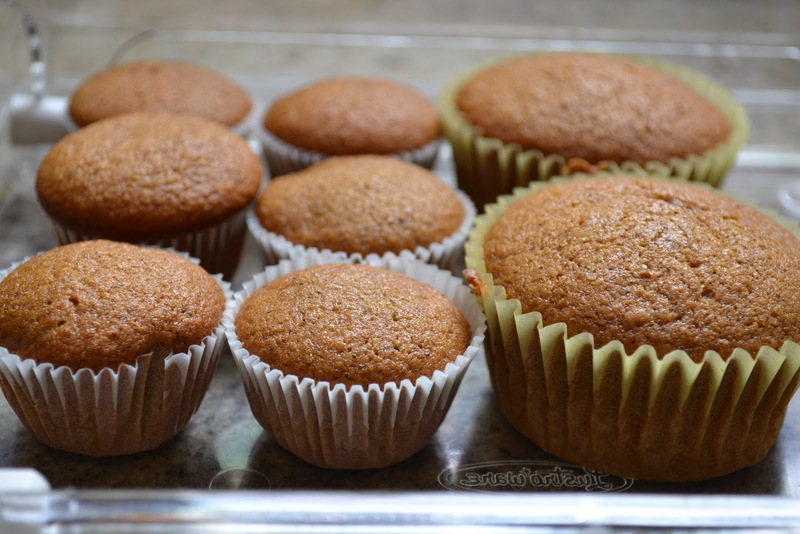 Trader Joe's Pumpkin Muffin and Bread Mix (Egg, Dairy, Nut free): Use an egg replacer like Ener-g, and you've got yourself some easy, quick, and delicious pumpkin muffins. Don't let Halloween pass you by! Have a spooktacular weekend everyone! I love baking mixes that I can actually easily modify to make safe for my kids. Sometimes, you find an allergy-safe mix that just doesn't turn out right when you add the Ener-g and other substitutions. It's really hit or miss. Which is why I love this mix. It still turns out deliciously moist and pumpkiny with the egg replacer, without too much of the overbearing spices that pumpkin recipes sometimes serve up to scare away little kids. And obviously, adding chocolate chips (we use dairy-free Trader Joe's Semisweet Chocolate Chips) to any recipe adds instant appeal in our household. Just add water, oil, and egg replacer like Ener-g Egg Replacer according to the box, bake, and enjoy! By the way, I'm thinking for my next batch I'll top my muffins with a dairy-free cream cheese frosting. Use a dairy-free margarine like Earth Balance and Tofutti Better Than Cream Cheese in place of traditional dairy products. Come sample some of Mariposa Baking's sweet creations at our upcoming Food Allergies Rock concert event. RSVP by 8pm PST on Monday 10/31 for your chance to win a free set of Allergy Alert Stick Ons! Mariposa Baking Company is a dedicated gluten-free bakery located in Oakland. The company takes pride in its artisan-crafted goodies that are mixed and formed by hand in small batches to ensure the highest quality. Mariposa uses natural ingredients throughout an extensive menu that includes brownies, biscotti, cupcakes, breads, and bagels. Last week I picked up some of Mariposa's baked goods at a gluten-free retail shop. I haven't eaten much wheat for the past two months -- a bit of a personal test to kick my self-diagnosed carbs addition -- so I was pretty excited to sample the goods and get in my bread fix. I bought a gluten-free, milk-free focaccia bread (it does contain eggs) and a pack of two pizza crusts (gluten-free, vegan). We ate this so fast we almost didn't get a picture of it! First, the verdict on the focaccia? Yum! It was light and delicious with a nice rosemary taste. Made with simple ingredients such as brown rice flour, tapioca, oil, eggs, and rosemary, the texture was just slightly on the delicate side. If I didn't know it, I would have never suspected it was gluten-free. Two 10-inch GF vegan pizza crusts for $9.50. A good deal! We used the pizza crusts that same night. And with a new crust to try, I figured I should use a new pizza recipe, too. I found a recipe similar to California Pizza Kitchen's rosemary potato and chicken pizza and made substitutions to eliminate milk and gluten: Earth Balance instead of butter; allergy-friendly Daiya vegan shreds instead of mozzarella; and San-J gluten-free tamari instead of soy sauce. (If you need something dairy-free and soy-free, look for soy-free Earth Balance in the dark red tub.) The recipe called for 1/8-inch thick potato slices baked for 45 minutes. I sliced the potatoes thinner than the recommended 1/8-inch width and they began to burn at 30 minutes. Besides that, I followed the recipe pretty closely. The verdict on the pizza crusts? They were impressive. I admit when I saw them in their package I had my doubts. They looked a little thick. But I preheated the oven to the directions on the package and assembled the toppings. After cooking the pizzas and tasting the final product, I was so happy! The crust was crispy on the outside with a soft texture when you bite into it -- in other words, it tasted just like a good pizza crust should. Despite overbaking the potato slices, the pizza was a big hit! Ryken takes another crunchy bite. The overbaked potatoes were like potato chips! Mariposa provides a complete list of ingredients for its mainstay products on its website. Many of Mariposa's products are dairy-free, egg-free, and/or nut-free in addition to being completely gluten-free. This is great for kids with multiple food allergies. It's nice to see that they do not use nut-based flours (such as peanut or almond flour) which are often seen as good substitutes for wheat flour. The bakery's sweet and savory treats are sold at many locations including their Oakland bake shop, the San Francisco Ferry Building kiosk, farmers' markets around the San Francisco Bay Area, and in specialty shops such as Miglet's Cupcake Shop which is where I bought mine. Aren't local to the Bay Area? You can still enjoy many of Mariposa's artisan goodies by buying online from their mail order menu. The winners of last week's raffle are Jessica Martines and Katryna Shek. Jessica and Katryna will each be receiving an Allerbling food allergy bracelet kit at the November 6th Food Allergies Rock event. Congratulations, ladies! This week's raffle prize is a set of 30 Allergy Alert Stick Ons. The lucky winner will work with a designer to custom make alert stickers to suit your food-allergic child's needs. The stickers are safe for dishwashers and microwaves. Read our review of the product for more information about the company, product, and their great customer service. Just RSVP this week for our Food Allergies Rock concert at our event page and your name will be entered in the drawing. RSVPs must be received by 8:00pm on Monday, 10/31, to qualify for this week's giveaway. Guests who previously registered but have not won a prize are automatically entered in this latest drawing. A winner will be drawn and announced on our blog on Tuesday. Please note that prizes must be picked up at the "Food Allergies Rock!" concert event. Unclaimed prizes will go back in the prize pot and be raffled away in a future online giveaway. 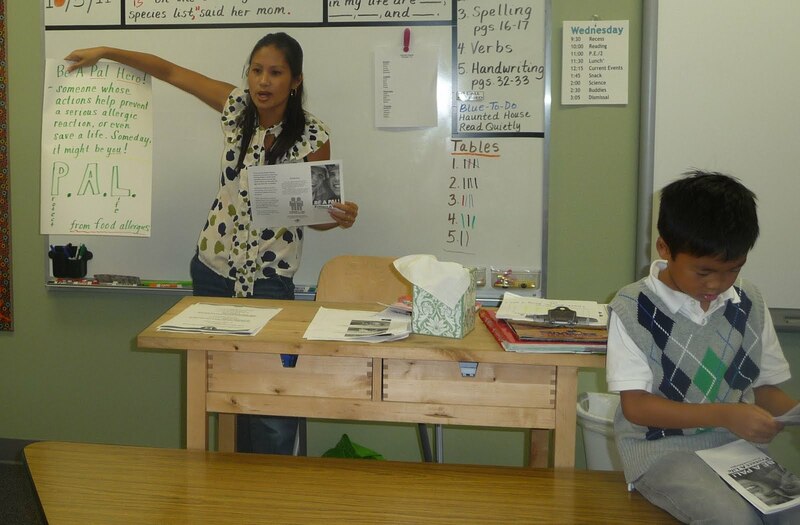 Contributing GAW writer Michelle K. recently gave a lesson on food allergies to her nut-allergic, seafood-allergic son's class. To read more about Michelle's presentation, check out her previous post. 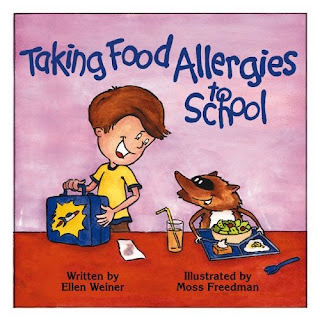 Taking Food Allergies To School by Ellen Weiner is great for food-allergic children, classmates, teachers, and friends. When I was looking for a food allergy book to read to my son's 2nd grade class, the title alone immediately caught my attention. It stated my exact intention of taking the topic of food allergies to school and doing a classroom presentation to increase awareness. This book is based on the author's son, Jeffrey, who has multiple food allergies including milk, corn, strawberries, peanuts and anything made with wheat. 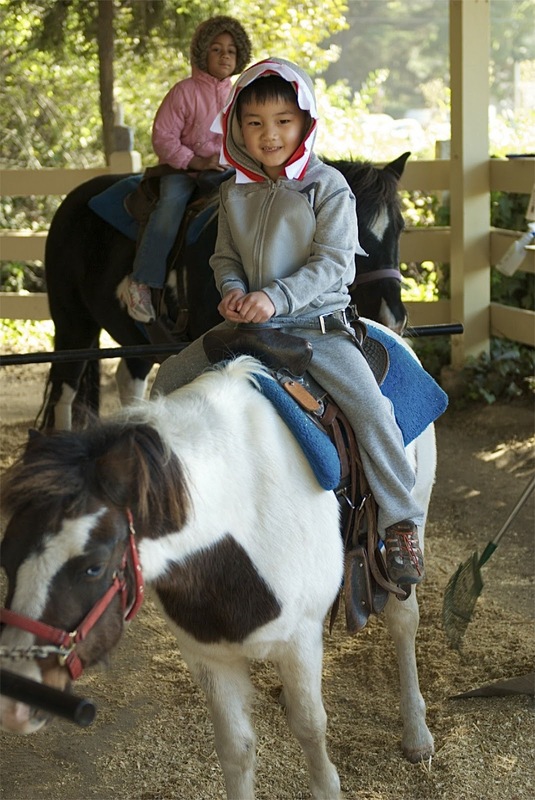 Jeffrey shows us that having food allergies is just a part of life and that although he must take safety precautions and follow a strict diet, food allergies don't have to interfere with the things kids love to do such as playing sports, going to school, and playing with friends. The book also describes the visible signs and symptoms of an allergic reaction as well as what happens microscopically. It goes as far as to describe the immunologic response to a food allergen, but in a very kid-friendly way. The language involves words such as white blood cells, antibodies, mast cells, and histamines, but the illustrations offset any hint of a strong technical tone by colorfully depicting these cells as having facial expressions. The cells come to life as they interact with each other and the allergen itself. By providing this explanation, I feel that this book reinforces the fact that having a food allergy is not made up, that it is a real thing, and therefore, should be taken seriously. Finally, the author even includes an Allergy-Free Pizza Recipe and a list of Ten Tips for Teachers. For those reasons and more, I think this book would make a great teaching tool for a classroom presentation on food allergies and a perfect donation to any classroom library. 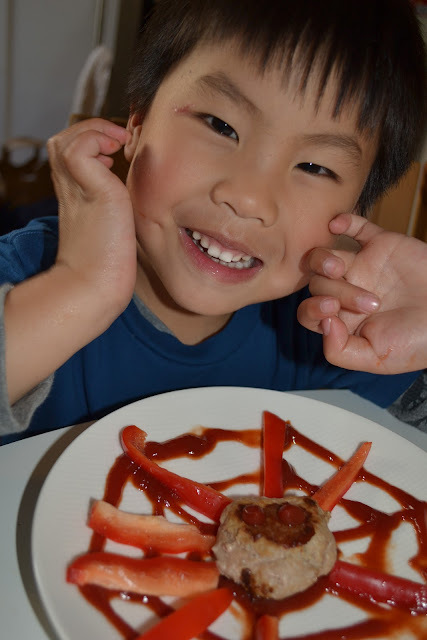 Kian's classmates are now more aware of food allergies, what happens to the body during a reaction, what he has to do to stay safe, and what they can do to keep their food-allergic friends safe! Want to browse through some food allergies books for kids? Come to our Food Allergies Rock event! RSVP on our event page by 8pm PST on Monday October 31 for your chance to win a set of Allergy Alert Stick Ons. 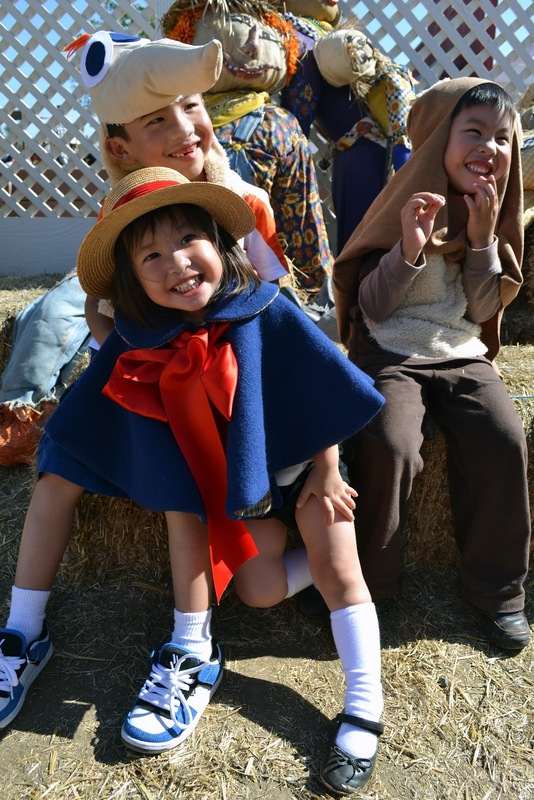 We Wanna See Those Smiling, Happy, Halloweeny Faces! If your kids are anything like mine, they LIVE for Halloween. By November 1st, they'll already be planning next year's costumes! And I love such a fun excuse to get creative and reserve some sewing time for myself. It's a win-win. 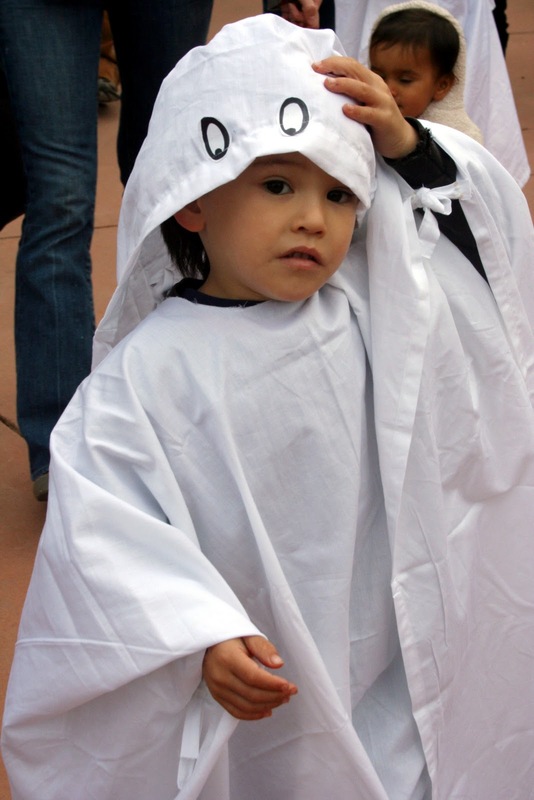 My kids were very specific this year about their Halloween costumes. *Sigh*...I start to reminisce about the days when a tiny bit of encouragement yielded the most classic Buzz and Woody combo. As they get older, not only are they more opinionated, but they're more tempted by the candy that fills their plastic pumpkins. Each year, they excitedly climb stairs leading up to each Edwardian, collecting candy that they won't be allowed to eat. At some point in the night they face the stark reality of their food allergies--as they watch other kids immediately rip wrappers off their spoils and devour them. They always look to me--the allergy gatekeeper--with wistful, but mostly disappointed eyes. In past years, I didn't have to do much but say, "We don't eat candy. 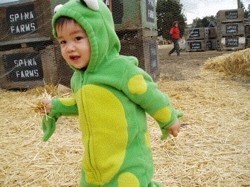 Give me your candy and I'll give you your [allergy-safe] cookie." Last year, Halloween landed in the middle of our Indian summer, and a trip to the grocery store to pick up their choice of popsicles and soy ice cream in anticipation of the big trade-in was enough. If you're fine with your kids having candy, but are overwhelmed by aisles and aisles of orange and black wrapped goodies, then check out BAAAB's Annual Halloween Safe Candy Lists for an extensive allergy-friendly treat list that is constantly updated and checked to make sure they make that each product continues to make the cut. Have your kids trade in their Halloween candy for something from the list, just as delicious and even more sweet knowing that it's safe. 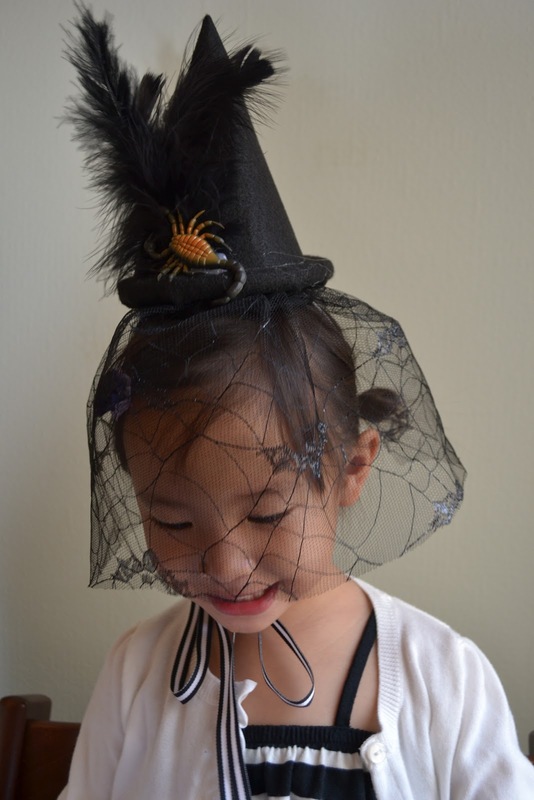 Need more help to quell their candy cravings? Have them save up their candy for our Food Allergies Rock! candy exchange, grab a gently used book, and exchange it all for a new-to-you book (and all your children's teeth intact for another year). I really am not sure what my plan is this year. My mom's simple penny-per-piece-of-candy trade-in was enough for us as children. Then again, Tristan is saving his pennies for an i-Pad, so I might have to up the ante if I go that route. Kids these days. I'd love to get some ideas about what you've done in years past or plan to do this year that will help keep your children safe--whether you have food allergic kids or non-allergic kids who have no business eating five pounds of candy ever in their lifetime. 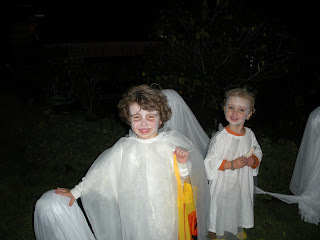 Email me with your Halloween-safe ideas along with a picture of your kiddies in full costume (doesn't have to be this year's costumes), and I'll post them over the next few weeks--don't be shy! I can't wait to see all of our Allergy Wise cuties all dressed up! 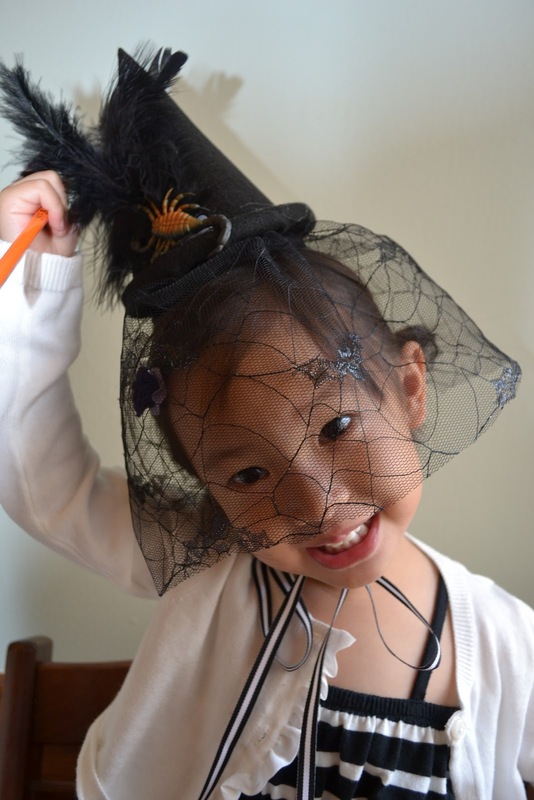 One of our readers, Selena, is a mother of a daughter with food allergies. Selena has started a White House-bound petition requesting that the Food Allergen Labeling and Consumer Protection Act of 2004 be revised to include for the labeling of items containing sesame seed and mustard seed. When deciding on what to consider "priority allergens", the allergy's prevalence among the general population and the severity of related allerigc reactions are considered. Sesame allergy is growing in prevalence in Europe and Canada so much so that it is listed as priority allergens along with the top eight (peanuts, tree nuts, milk, soy, egg, wheat, fish, shellfish). 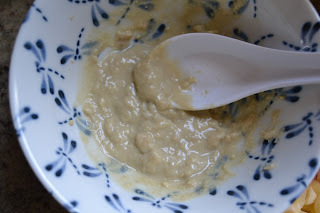 It is sometimes hidden in labels as "tahini", "natural flavoring", and "spices". Current figures indicate that approximately 0.1% of the U.S. population -- that's about 3 million people -- are afflicted with sesame seed allergies. Mustard, while not a very common food allergy, has precipitated severe reactions. Also, it is a common ingredient that often goes unchecked in food labeling as the generic term "spices" which can make it very dangerous for those with life-threatening mustard allergies. The petition needs 25,000 signatures by November 5th to be considered. To read about the petition and add your signature, check out the official petition here. Whether your family is affected by sesame, mustard, and other allergies or not by any allergies at all, I hope you will consider adding your support to include sesame and mustard in labeling. The clearer the labeling of any product we consume, the more informed our choices will be. This supports overall health and well-being for us all. For more information about sesame and mustard allergies, check out Allergic Living's article. To follow Selena's food-allergic journey, check out her new Amazing and Atopic blog. When you have food-allergic children, you learn to get creative. But as every parent knows, there is no need to reinvent the wheel. Lots of sites feature vegan or even allergy-friendly recipes or meal ideas (ahem...). But even if they don't, with some imagination and ingenuity, you can turn most recipes into something your children can and will eat. Just sub in safe and loved ingredients. I saw this meal idea and HAD to have it! 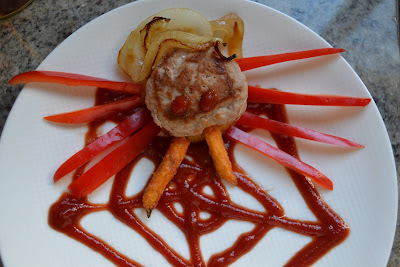 Since my kids can't have egg or dairy in the raviolis, I modified the recipe, making them Creepy Crawly Spider Burgers on Crispy Polenta Rounds. So easy! The spider body is a mini turkey burger and sits on top of a fried polenta round. The legs are bell peppers and the web and eyes are chilled ketchup that I piped out of a Ziploc with the corner snipped off. My kids made tarantulas with caramelized onions for hair and sweet potato fries for fangs (Trader Joe's frozen sweet potato fries). The whole concept was fun, but honestly, I had the kids at the ketchup web. The great thing about kids is that with a bit of effort, they're really easy to impress. Enjoy! Snack-'o-Lantern Simply a scooped out orange with carved out facial features and added fruit salad. Healthy, easy, and delicious! Black Bean Cat Crudites Lots of your child's fresh veggies and this simple black bean dip make this snack the cat's meow! Squiddlies Poke uncooked spaghetti (try buckwheat or rice pasta for gluten alleriges) through hotdog chunks and cook for the weirdest pasta your kids will eat--and love! And don't forget to send your kids to school with their food allergy bracelets, especially on Halloween, when both safe and unsafe treats will likely crop up throughout the day. What? Your FA children don't own an allergy bracelet yet? Well then, register to win a full Allerbling bracelet set just by RSVP'ing to our Food Allergy Rocks event in San Francisco on November 6. We'll see you all there! And until then, a creepy, crawly Halloween to you all! The winner of last week's raffle is Lori Fletcher. Lori will be receiving a Kyle Dine CD at our November 6th Food Allergies Rock event. Congratulations! 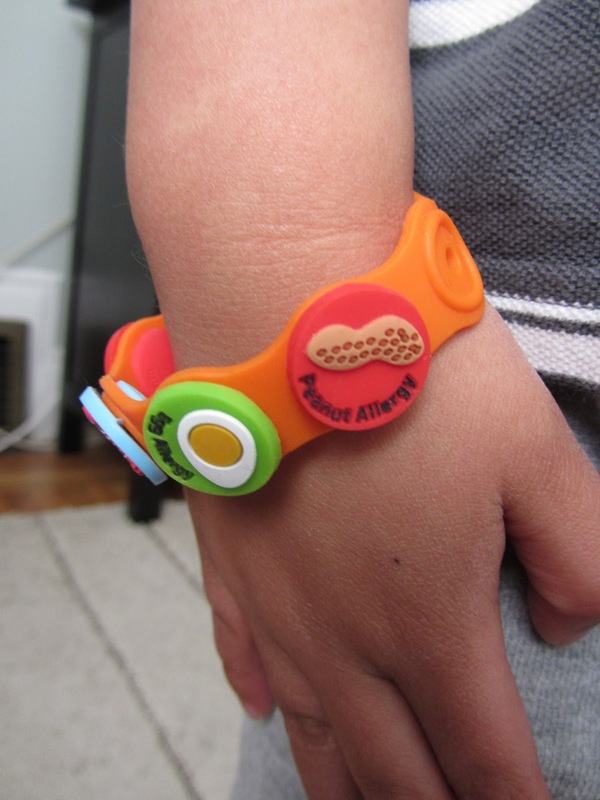 We are excited to be giving away an Allerbling food allergy bracelet set. The set includes two different-sized wristbands for your growing child, picture charms for each of the eight most common food allergens, and a medical cross charm. Just RSVP this week for our Food Allergies Rock concert at our event page and your name will be entered in the drawing. RSVPs must be received by 8:00pm on Monday, 10/24, to qualify for this week's giveaway. Guests who previously registered but have not won a prize are automatically entered in this latest drawing. A winner will be drawn and announced on our blog on Tuesday. "Until there's a cure, education is key." -Eleanor Garrow, Vice President of Education and Outreach for FAAN. 1) Read two books. Never having owned a storybook on food allergies, I came across a good list online at the KFA: Food Allergy Book Shop which you can find here. So I ordered any that I thought would be most relevant to a 2nd grade class. I then narrowed it down to two that I thought were age-appropriate, educational, informative and at the same time gentle and fun. The two books I chose were Taking Food Allergies To School by Ellen Weiner and Food Allergies and Me by Juniper Skinner. I just posted a book review on the former here. A book review on the latter is written by our very own Get Allergy Wise mom, Irene Chu, which you can read here. Most importantly, these two books portray two well-adapted and conscientious kids who navigate through the food allergy world confidently and successfully. Furthermore, they both illustrate how having food allergies is just one of many elements that makes a person who they are. 2) Discuss the Be A P.A.L. program. If I had only 5 minutes to do a presentation, thi s would definitely be my go-to topic! 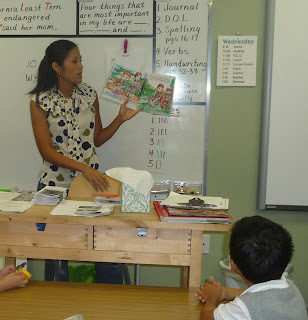 I feel that the brochure lays out everything you need to know to make a complete food allergy presentation in a classroom setting. Created by FAAN, the Be A Protect A Life Program "is an educational awareness program designed to help parents and educators teach students what food allergies are and how to help their friends who have food allergies." –FAAN. Need I say more? Even better is the fact that FAAN provides resource materials that you can print out including a poster, P.A.L. HERO awards, and even a Girl Scout Patch Program. I offered the poster to the teacher and printed out one brochure per student and handed them out during this segment. Together we went over the entire brochure which clearly outlines 5 simple steps to keep your classmates with food allergies safe. Many thanks to FAAN for these invaluable teaching tools! 3) Review. If a reaction is going to happen at school let's say at lunchtime, the students are most likely going to be the first witnesses to a reaction. That is why I felt that it was imperative for me to review the signs and symptoms of an allergic reaction so they could learn how to identify a reaction if they ever encounter it. The ensuing discussion led me right into a demonstration of what would happen to Kian's trachea if a peanut entered his body and a reaction took place. 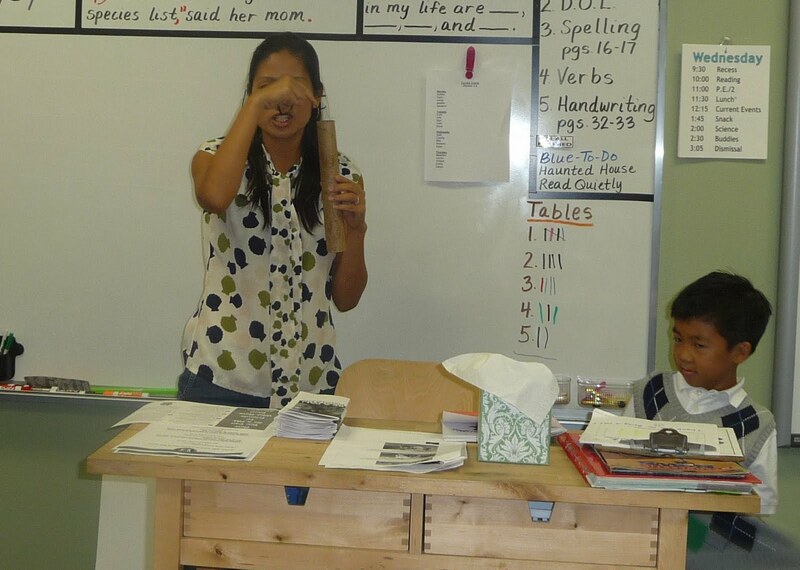 Using a cardboard tube taken from inside a paper towel roll (with a rubber band wrapped around it), I showed them that a normal trachea (windpipe) is open much like the hole in that tube. 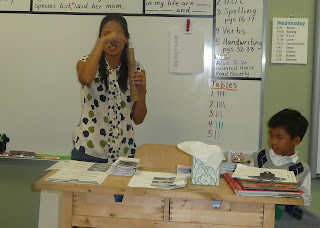 I then took off the rubber band so as to represent a cross-section of the trachea, using my hands, I showed them how it could swell up like a marshmallow all the way around causing the inside of the tube, or airway, to become constricted, or completely closed. Eyes widened and jaws dropped. This demo helped me make my next point clear: never take food allergies lightly. Serious things can happen and that's why we never bully or tease someone for having food allergies. And a simple review wouldn't be complete without reviewing the protocol of what to do in the event that a student witnesses these signs which is to tell an adult immediately. The adult should then retrieve the necessary medications and call 911 in the event of an anaphylactic reaction. 4) Establish a Lunch Buddy system. So my son, Kian, who has multiple food allergies including peanuts would often sit at the peanut-free table at school all by himself, th at is until I established lunch buddy system. 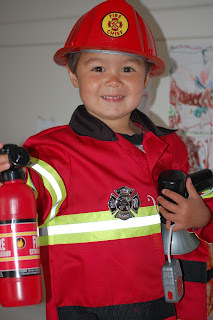 Frankly, he prefers safety over being included socially, he's just one of those kids, but a mom's going to do what a mom's going to do. I finally asked him if he would like it if someone sat with him at lunch time and his face beamed in delight . He answered, "Yes, mom, I would like that." So I created the Lunch Buddy system where each student volunteers once a month to bring a nut-free lunch and sit with Kian at the peanut-free table. How hard is that? They can volunteer alone or bring along friends. The more the merrier. So I provided the teacher with a sign-up calendar as well as a letter to go home to the parents. Contact us if you'd like to get a copy of the letter and we'll be happy to email it to you. Parental feedback has been nothing but positive. They tell me that their child is excited to have their turn to be Kian's lunch buddy! One mom even called to share with me her personal experience with severe food allergies and how everything will be alright because it's definitely manageable. 5) Honor the teacher. I have to say, I cannot be happier with my son's 2nd grade teacher. Not only is she amazingly organized and structured, not to mention talented, but she is compassionate to needs of the food allergy community – a huge BONUS! Since the beginning of the year, she has been very attentive to my concerns and has been diligent in having the students get in the habit of washing hands after lunch and snack whether or not they've eaten nut products. What can I say, she just gets it. It is this simple task of handwashing that minimizes the risk of a food allergy reaction due to cross-contamination or second-hand contact, not to mention the added benefit of having good hygiene and preventing the spread of infection. So at the end of my presentation, I asked the teacher to come up to the front of the classroom and said, "I want to thank you for allowing me to come into your classroom to teach the kids about food allergies. By doing this, you've Protected A Life from food allergies. " I then handed her the P.A.L. HERO Award. I also presented her with a Kyle Dine's Food Allergies Rock CD so she could get a preview of Kyle Dine's visit to our school next month (more on that in another post)! Later that day I received an email from her saying, "I'm still at school rocking out to Allergy Rock! Your presentation was not only informative, but also lighthearted and fun! The children could've sat through another 30 minutes or more." If you're a busy mom like me living in the food allergy world, I would highly recommend doing a classroom presentation on food allergies! The first step would be to approach the teacher. 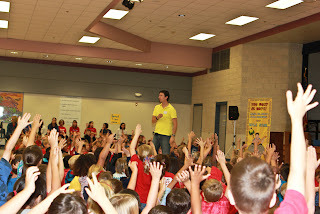 I would emphasize the importance of raising awareness in the classroom and mention that teaching kids how to identify signs of a reaction could help Protect A Life and in doing so, turn the students into heroes. If we can gain the support of not only the faculty and staff, but also the student body, then we've covered all our bases and the school environment will be that much safer for our children. Best of luck on your presentations! We'd love to hear about them! And don't forget to RSVP to the Food Allergies Rock Event in San Francisco! Fall is here. 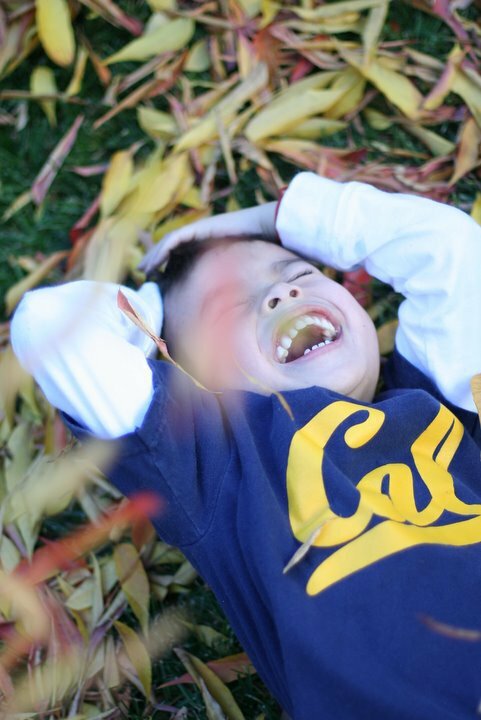 Let the leaf tossing begin! We've had an extended summer here in my neck of the woods. After temperatures soared into the 90s on and off throughout September, we finally got rain on the first of October. 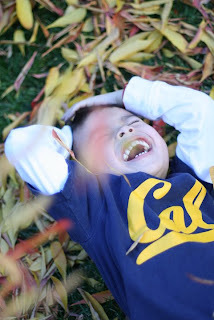 Goodbye, Indian Summer, and welcome, Fall! Fall is a great season for the senses: the vibrant and changing colors of the trees; crisp cool air sneaking under your collar; dried leaves crunching under your shoes; apples, pumpkins, and knobby gourds in practically every color of the rainbow; and the distinct smell of squashes and spices cooking in the kitchen. One of my favorite Fall smells is baked butternut squash. So warm and inviting! And with its rich flavor and bright orange hue it makes for a hearty and beautiful soup. 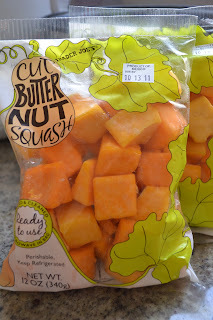 Buying butternut squash at my local Trader Joe's for less than $2 also makes for a very affordable meal! I recently made butternut squash soup in two different ways, both free of seven of the eight most common allergens (it had soy from the Earth Balance). One was a dairy-free version (subbing Earth Balance in place of butter and omitting heavy cream) of a bisque recipe I've used at Thanksgiving. Later in the week I made a different butternut squash soup with the kids in my son's preschool. This recipe had a few more vegetables and chicken broth. While both soups were tasty, the second soup was over-the-top divine! Make sure you use a broth you love! Instead of cooking your squash on the stovetop, cut your butternut squash in half lengthwise and bake it cut-side down at 400F for 35-45 minutes (time varies with the size of the squash), or until a knife can easily pierce it. Do try to prevent overbaking and take it out before it becomes too soggy and loses its flavor. Also, if chicken is something you eat, try using chicken broth or stock instead of vegetable broth. You'll love the flavor that it adds to your soup. 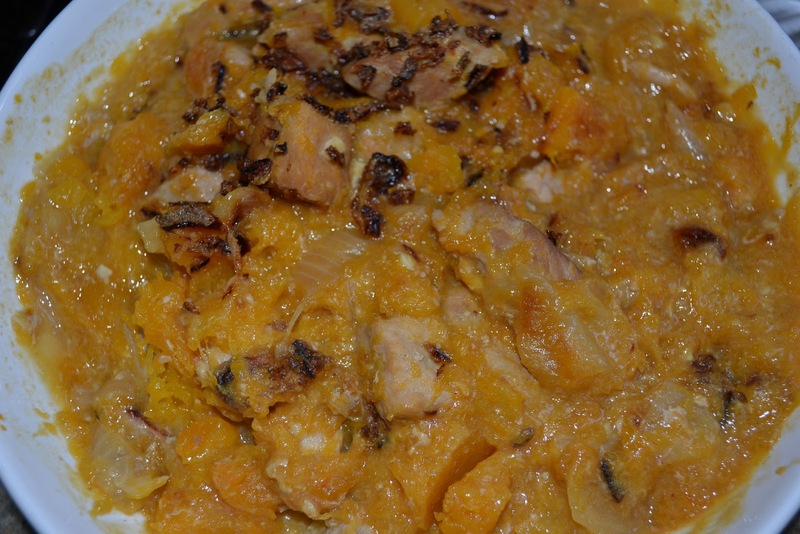 Bake butternut squash in a preheated 400-degree oven for 35-45 minutes. A knife should easily cut through the squash but the squash shouldn't be so overcooked that it caves in. While butternut squash is baking, heat a large pan. Add olive oil and vegan margarine. Add cut vegetables. Saute for 10-20 minutes until vegetables begin to get soft. Add chicken or veggie broth to the pan. Continue cooking vegetables in the broth stirring often. When the butternut squash is finished baking, cool it on its pan. Once cooled, remove the squash's peel carefully using a knife and fork and cut into cubes. Add squash cubes to broth and vegetable mixture. Continue cooking uncovered over medium heat, allowing the soup to start boiling. Once the vegetables feel tender, turn off heat. Using an immersion blender or a standing blender, blend the soup's ingredients until the texture is smooth. If the soup is too thick, thin it out by adding more chicken stock. Taste soup. Add salt and pepper to taste. Garnish with leaves or small sprig of rosemary if desired. The soup went over about as well as you can imagine with a school full of preschoolers -- some loved it, some ate one spoonful and didn't want anymore, and some couldn't be convinced to try it. I guess butternut squash soup is no exception to the "kids-will-need-to-try-a-new-food-multiple-times-before-they-like-it" rule. I have to say, though, that the recipe was a huge hit among all the teachers and volunteering parents. One week after its debut and three of the seven adults there that day had gone home and made batches of their own! For the non-adventurous, non-vegetable eaters in your family, make trying the soup more appealing by tossing it with your pasta of choice or making safe garlic bread to go with it. Hopefully after a few tastes, your kids will take to this vitamin-rich Fall treat! Speaking of Fall treats...we've got one for you on November 6th! Bring your families to Get Allergy Wise's "Food Allergies Rock" event with special guest food allergy musician Kyle Dine. Enjoy great music, learn about local and national allergy-friendly businesses, enter to win some fabulous prizes, and bring in your unsafe or unwanted candy and a gently used children's book in exchange for a "new-to-you" book! Did we mention this event is nut-free and free-free? What are you waiting for? RSVP at our event page today! 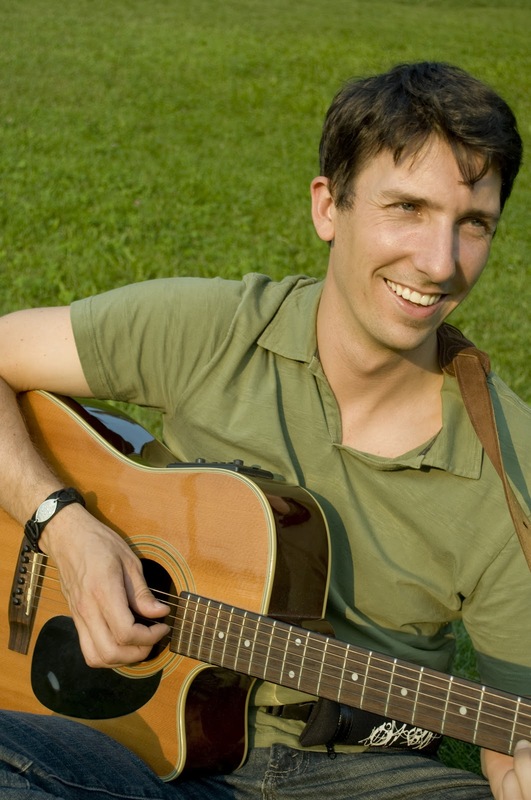 Kyle Dine became the world's first and only dedicated food allergy musician in 2006. With catchy, clever tunes like "Epi-Man" and "Able to Read a Label" and a voice reminiscent of Green Day frontman Billie Joe Armstrong, Kyle has created songs that resonate with kids living with allergies. 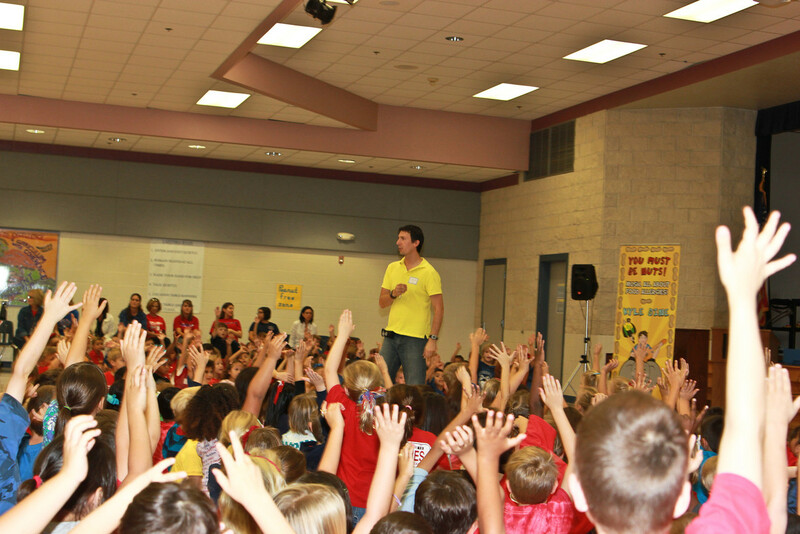 His upbeat music also educates non-allergic peers and adults on what it looks like and feels like to manage food allergies. 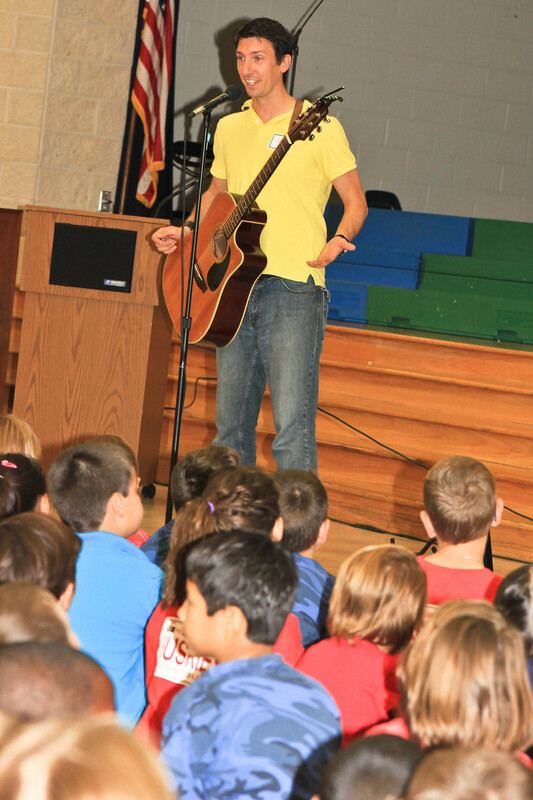 Kyle performs at approximately 50 school assemblies and special events throughout the year. Hailing from Ontario, Canada, his tour has taken him as far east as Halifax and as far south as San Antonio, Texas. Get Allergy Wise is honored to have Kyle at our Food Allergies Rock Event for his first San Francisco Bay Area performance! (Get Allergy Wise) What were you allergic to as a child? What food are you allergic to now? (Kyle Dine) I was initially diagnosed with allergies to peanuts, tree nuts, eggs, dairy, and penicillin. Since then, I’ve only outgrown my dairy allergy, but have now added fish, shellfish, and mustard to my list. Food allergies are a lot more common these days than they were a couple decades ago. What was it like for you growing up with multiple food allergies? I am amazed at the job my parents did in keeping me safe, and making me feel normal despite the fact that I did not know anyone else with allergies. I also realize that I am lucky that I did not suffer any serious anaphylactic reactions while growing up in a time that did not have today’s food labeling regulations. This was before precautionary labeling was used (e.g. “May Contain” statements) making it very difficult to know what packaged products were safe. We ate mostly home-cooked meals and stuck with the basics. How did you become a food allergy singer? Tell us about the first food allergy song you wrote. The idea first came to me after writing a song with a child at summer camp. I was teaching the boy guitar when I noticed that he was carrying an auto-injector. I found out that he was also allergic to peanuts and we started writing a silly little song together about peanuts and how we are just fine living without them! That little ditty was the basis of my first allergy song, “That’s a Peanut”. Excellent story of how it all began! You mention auto-injectors. You sing a song (one of my favorites) called "My Epineph-Friend". Have you ever had to use your Epi-pen? Isn’t that song fun! I love planting the idea in kids’ heads that they should name their EpiPen. It’s just like a friend after all, right?! I had to use my EpiPen once, but should have used it on a few other occasions but, stupidly, did not. The one time I was offered a square by someone I knew and trusted, but unfortunately they had nuts in them by accident. I used my EpiPen right away as the symptoms were quite severe within minutes of ingestion. I went to the hospital where I required more medicine, but ultimately I was okay. I learned a very valuable lesson that day in that I should always ask as many questions as possible when offered food and never eat something unless I’m 100% sure it’s safe. Glad you are okay and all the wiser. Congratulations on your recent wedding, by the way. I read that your wife has Celiac disease. I wonder if your shared challenges around food created an instant connection when you first met. I know I feel a sense of closeness with parents of food-allergic kids. Gee thanks! We’re really happy and riding high these days! As much as I would love to promote “inter-allergy/intolerance dating”, my wife and I are both aware of the extremely high odds that our children will have allergies or intolerance. I often joke that they will be “tall, dark, and allergic!” At least we will be prepared. There was an initial sense of understanding between us, but I truly think that a true partner will be able to learn how to keep you safe whether they have an allergy/intolerance or not. The biggest benefit I find is the support which comes directly from her level of understanding. If I forget a detail at a restaurant, she is quick to jump in and have my back. Through all of these years of living with her, I have learned so much about gluten and its sources and try to be the best advocate I can for her. Do your wife and you cook separate meals or do you accommodate for your combined food allergies and intolerances? We mix it up between cooking separate meals and joint meals. It helps us cut costs with our groceries and have our own treats, but we are very stringent in the kitchen and have color coded utensils, plates, cutting boards etc. etc. So tell us the story behind your song, "Food Allergies Rock!" What to you is the best thing about having food allergies? My favorite thing about having food allergies is the knowledge it brings you. My experiences and stories can go so far in helping out others with allergies, as well as educate non-allergic people. I’m amazed at the number of parties I’ve been to where a group of people stood around me wanting to learn more about allergies and anaphylaxis! What do you think is the hardest thing about having food allergies? I think a lot of parents assume that it’s the feeling of being left out. I’ve talked to many kids and teens with allergies, and the most common answer I hear for this question is “being a burden”. I feel the same. I’m a pretty low-key guy and have never wanted to inconvenience anyone because of my allergies. I don’t like them being a huge deal in social situations. If I can’t eat something, no problem. I will find a safe food, it might be as basic as a salad with no dressing, but I am fine with that and do not feel comfortable with people fussing over me. How does it feel to be a rock star in the food allergy world? Have you had any moments from touring that have especially inspired you? It’s humbling. People tell me that I’m doing a really great thing. But truthfully, I’m having so much fun doing this and am amazed that “allergy music” has impacted so many families across North America. There are so many feel-good moments from touring I can’t name just one. When kids come up to me showing off their EpiPens proudly and compare their MedicAlert bracelets with mine, I feel incredible. These kids are on the right track and are empowered over their allergies - something that didn’t happen to me until I was in my twenties. I am so lucky to do what I do. I do not take it for granted, and document it all with a giant overloaded scrapbook with memories that will last a lifetime. I certainly didn’t dream of being a food allergy musician in high school, but am I ever glad that’s how it turned out! Come meet and hear the talented and gracious Kyle Dine in person at our November 6th Food Allergies Rock event! 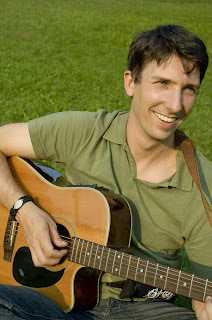 For more information about Kyle and his music, check out his website and blog. FAAN members can receive a discount on his CDs through the FAAN online store. Our winner of last week's raffle is Julie Reyes. Julie will be receiving a copy of Juniper Skinner's Food Allergies And Me children's book at our November 6th Food Allergies Rock event. Congratulations! This week we are thrilled to be giving away a CD by musician and event headliner, Kyle Dine. Whether or not you have kids who are living with food allergies, you will find yourselves bopping around to Kyle's upbeat, original songs. The lucky winner will have a choice of Kyle's premier album, "You Must Be Nuts!" and his latest collection, "Food Allergies Rock!" Just RSVP this week at our event page and your name will be entered in the drawing. RSVPs must be received by 8:00pm on Monday, 10/17, to qualify for this week's giveaway. Guests who previously registered but have not won a prize are automatically entered in this latest drawing. A winner will be drawn and announced on our blog on Tuesday. I am obsessed with the Burmese pumpkin pork stew they serve at B Star and Burma Superstar in the City. We are so lucky to have good (and inexpensive!) eats so close by. Unfortunately, it's tricky to eat at these types of restaurants with the kids because of their food allergies (egg, dairy, shellfish, nuts). Nuts, eggs, and shrimp paste are often used or hidden in these recipes, and the risk of cross-contamination is also very real. So onward I searched for a yummy alternative that is kid and allergy-friendly. I found this recipe online, and wanted to try it out with a few ingredient changes. 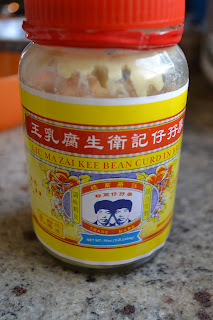 To address the food allergies, I used preserved tofu instead of shrimp paste, and olive oil instead of peanut oil. I also added sugar, coconut milk, garlic powder, and a bit more garlic. I love how convenient the TJ's butternut squash is! 1. Marinate meat with salt, sugar, garlic powder, soy sauce, a bit of olive oil (those ingredients make up the basic Chinese marinade), and turmeric for up to an hour. I only had time to marinate for about 15 minutes, and I'm sure a little more time would've helped seal in the flavors. 2. Over a med-high pan, heat oil. Add and saute together garlic, ginger, and preserved tofu and onions for about a minute, then add pork with marinade, browning slightly on sides. 3. Add 1 cup water and cover, bringing to a boil over moderate heat. 4. Let it cook for about 30 minutes, and add coconut milk and pumpkin or squash. 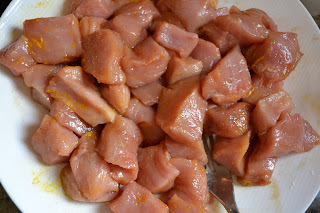 Simmer until pork is tender, about another 10 to 20 minutes. Serve over rice or coconut rice . 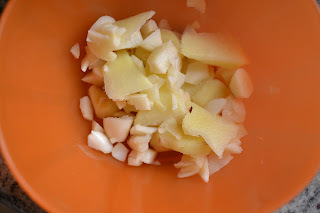 To make coconut rice--my own personal incredibly easy, delicious and very sweet version of it: I cook white or brown rice as usual in the rice cooker, but I substitute coconut milk instead of water. You can dilute the coconut milk down if you want. B Star serves this stew with their coconut rice sprinkled with fried onions, which can be found in the Asian market in a plastic canister. Next time I will try cooking this stew in a slow cooker for convenience. I personally love sweet stews. But if you want less sweet, you can omit the sugar, and replace the coconut milk with water as in the original recipe. Also, I liked the squash a bit chunky with some melted into the sauce, so I added it earlier. If you like yours more firm, add later. As with most stews, it tasted even better on day two! Good luck! My mother-in-law went crazy with the fried onions and added them directly atop the stew--t was admittedly very delicious! S.O.S. -- Save Our Sunbutter!